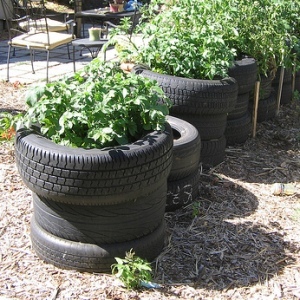 Growing potatoes in old tires – a bad idea. I few days ago I wrote a post about growing early potatoes. Since then, I’ve been receiving emails about growing potatoes and other root vegetables in stacks of old tires which I didn’t mention as an option. Tire rubber is toxic!!! Of course it is, and over time the microbes break down and leach compounds into the soil. Leachate from rubber mulch has been shown to contain aluminum, cadmium and chromium, plus rubber plasticizers, softeners and accelerators used in the vulcanization process. Also, zinc can leach from them at toxic levels. If you walk into a tire warehouse, just the smell will put you off. Stick with containers made of natural materials. Who wants to eat rubber?